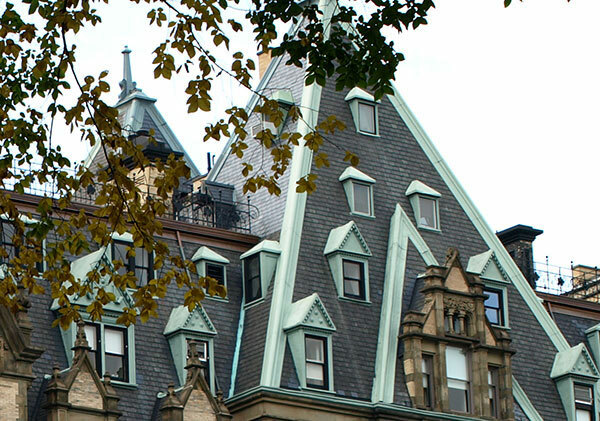 New York City apartment living was exciting and grand in the late 19th century. 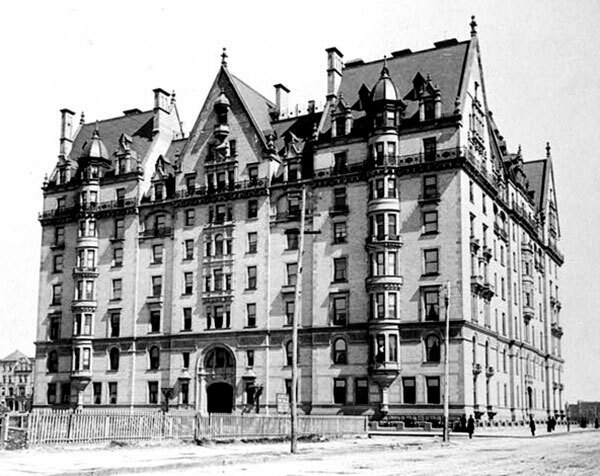 Co-op apartment living was popular in New York in the late 19th century. The nineteenth century New York "city lot", when first planned, was believed to be the best thing that could be devised for compelling the intending house builder to give himself plenty of light and air on two sides of his house. It was thought that if the lot was long and narrow he would have a garden in the rear of the house. 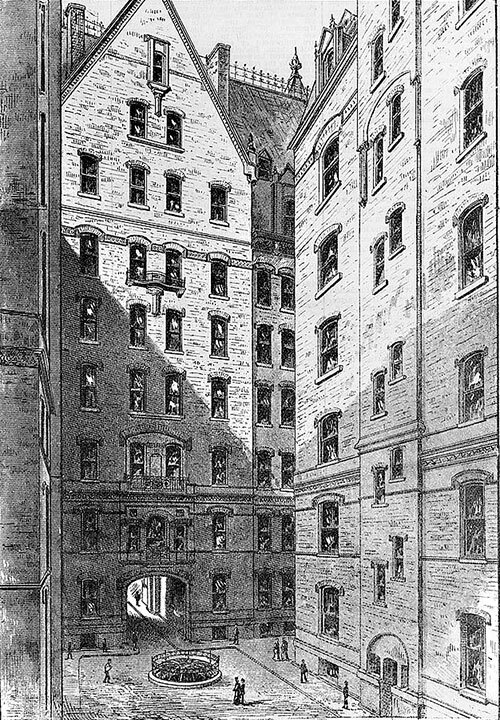 This expectation was seldom realized, for the high value of the land and the foolish greed of the landlords soon resulted in the conventional folly known as the New York “tenement-house.” The disposition was to cover nearly the entire lot with buildings of deep houses with dark rooms in the middle. In contrast, some plans for apartments were proposed for using all, or nearly all, the land in a lot, and, at the same time, to give every room a window on the open air. 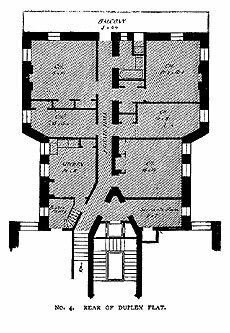 The plan shown below was intended for a large tenement, containing a number of flats suitable for the best class of residents and occupying the end of a block fronting on an avenue. 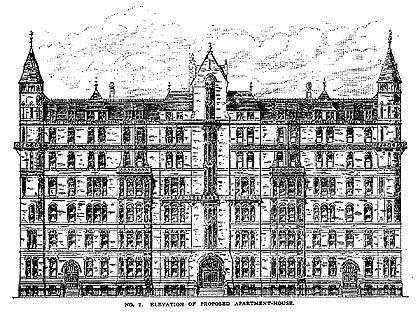 The elevation shows a seven-story building, with a basement and sub-cellar. There were three entrances on the avenue, those on the sides being intended for single flats on the first floor, while the center door was for all the flats above the first floor. The common method of erecting such a group of flats under one roof was to place the flats perpendicular to the street. In such cases, each group of flats had a single narrow stairway with a door on the street, or, as in the case of more pretentious houses facing an avenue, with entrances on the two side streets, with a hall running the whole width of the block at the rear of all the flats. In arranging the proposed building, one entrance was provided for all the flats above the street, and the hall divided the building into two wings. The above floor plan represents a little more than half of the first floor above the street, the part not shown was a duplicate of that given. The building was quite shallow and the flats were placed parallel to the avenue, with one end to the street and the other end to the center of the building. The plan shows the position and size of each room. The entrance was by a private door opening on the hall near the elevator. The passage-way was lighted by a window at the end and gave access to all the rooms. Every room had windows on the avenue or garden, and the end rooms had windows on the street. The stairway near the bathrooms led to a trunk-room over the bathroom, each of these rooms being half the height of the other rooms. 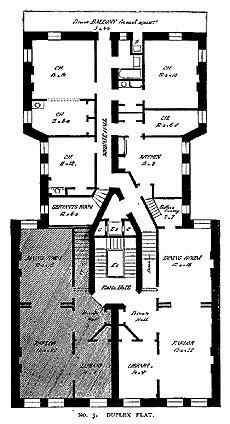 The servants' elevator was placed in the rear of the hall and opened by a private door on the kitchen. Courtyard of the Dakota apartment house, New York City circa 1884. The garden in the rear was designed to be free to all the tenants, and, by having a gate on the street, all the waste of the house could be removed at this entrance through the garden. 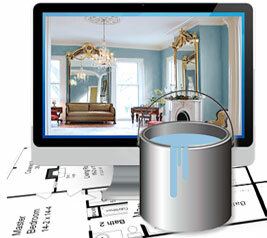 This house was designed for a club or association, somewhat like those described below. 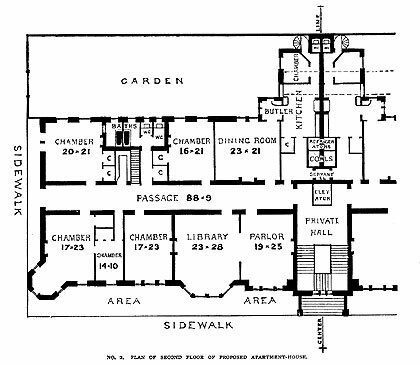 The two floor plans on below show the manner of laying out a costly apartment house erected on West Fifty-Ninth Street, between Broadway and Seventh Avenue. Here an attempt was made to keep to the common form of city lot and to cover nearly all the space of two lots. The land was 50 feet 100 feet and the building was the full width of the two lots on the street, and extended back about 18 meters. The rear was somewhat narrower, and extended to within 5.5 meters of the rear line. This building had a sub-cellar and basement, with seven floors above the basement in the portion next to the street. The first, second, third, fourth, and fifth floors were each 14 feet high, and the sixth and seventh 9 feet high. The rear portion of the building had ten floors above the basement, each 9 feet high. This difference in the number of floors in the two parts of the house was designed to give some of the apartments more rooms, and to give light and air on three sides. The plans show the way in which the second, fourth, and sixth floors were laid out. The entrance was through a hall in the center, between the two flats on the first floor. The stairs and elevator were shown in the plan, with the private entrance to each of the two flats. There was a private hall, library, parlor, dining-room, butler's pantry, kitchen, and five chambers. The stairway next to the dining room, led downward a few feet to the rear part of the building, all the rooms here being on a different level. The short stairway in the butler's room led to a second room, just above it, that was used for a storage closet or for a coal room, these two rooms being half the height of the front rooms. The rear rooms were not as high as those in front, and hence the name given to these flats, duplex or doubled flats. The intervening flats were all on the same level, and the house was simply divided through the center into two sets of apartments. 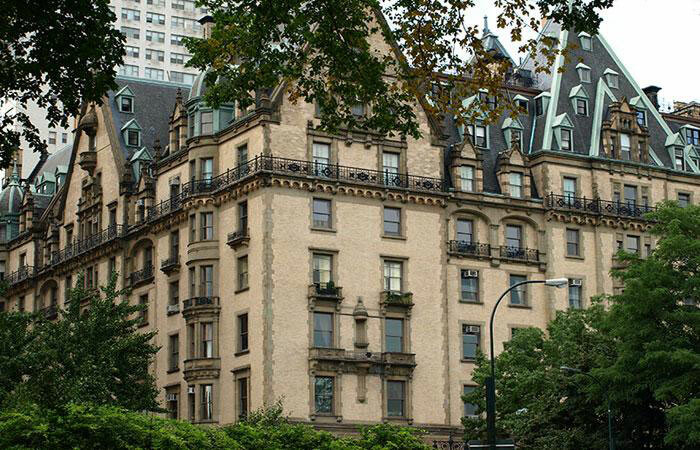 All the flats had a balcony on the rear, and private doors opening on the servants' elevator. The coal bins were placed next this elevator, so that they may be filled directly from the elevator. These buildings were often built upon a cooperative plan, wherever the regular building associations or cooperative banks were not in operation. A number of intending house builders, of about the same social position and means, formed a society and erected an apartment house for their own use. They elected from among their number a president, secretary, treasurer, and building committee. There could be (say) eight families in the club, and it was their aim to build an apartment house having (say) nine distinct flats. Each member gave a bond to all the others for the sum of (say) one thousand dollars. This made the capital of the club, and, in the name of the club, the building committee bought a lot and to construct an apartment house costing (say) eight thousand dollars. The land was bought and the building built in the name of only one trustee, and was held by him till the building was sufficiently advanced to enable him to obtain a mortgage. This mortgage was placed on the land and building to cover the difference between the actual cash paid in and the cost. When finished, the building was the property of the eight members of the club, each one having an undivided eighth share of the whole. The trustee then gave to each member a lease for ninety-nine years, at a nominal rent of one dollar a year, for the apartments he was to occupy. In selecting a flat, the members held an auction to bid for choice of flats, the premiums paid for the choice being equally divided among them all. By this arrangement, those who must take the least desirable flats were compensated in money. The leases having been given and recorded, the trustee transferred the fee of the land to the eight members as holders in common. The ninth flat was let on a short term to any tenant that may be accepted by a vote of the entire club. The running expenses of the house, heating and lighting of halls, janitor, repairs of hall and roof, water, interest on mortgage, etc., were offset by the rent of the ninth flat, either wholly or in part. If it was not enough, the expense was divided between all the members. In some cases it was found that the rent of the extra flat was more than sufficient to pay the working expenses, and the surplus was used to extinguish the mortgage.